Coast Guard Cutter Margaret Norvell is named after lighthouse keeper Margaret Norvell who served with the U.S. Lighthouse Service for more than 41 years. U.S. Coast Guard photo. 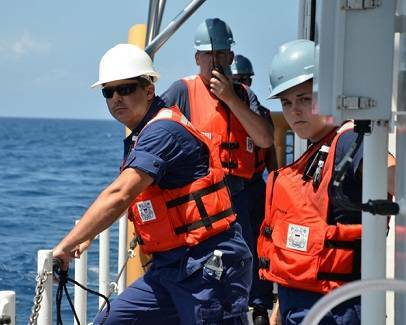 The crew of Coast Guard Cutter Margaret Norvell. U.S. Coast Guard photo. 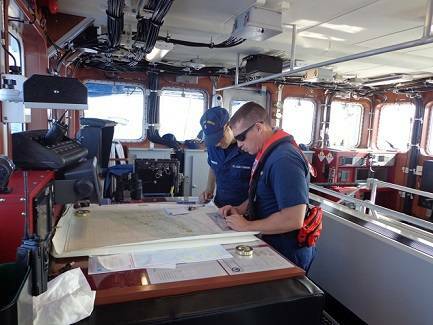 Crewmembers on the bridge of Coast Guard Cutter Margaret Norvell. U.S. Coast Guard photo. Underway aboard the service’s newest fast response cutter. U.S. Coast Guard photo. She was a leader. She was a trailblazer. She was a lifesaver. She’s the namesake of the Coast Guard’s newest cutter – Margaret “Madge” Norvell. 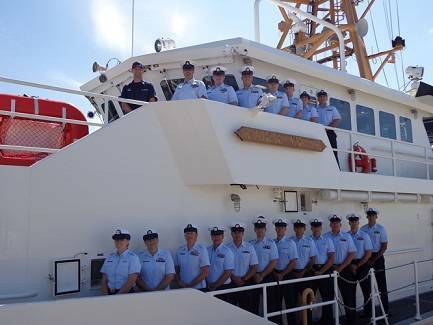 The Coast Guard welcomed their newest fast response cutter to the fleet this weekend as Coast Guard Cutter Margaret Norvell was commissioned in Miami. 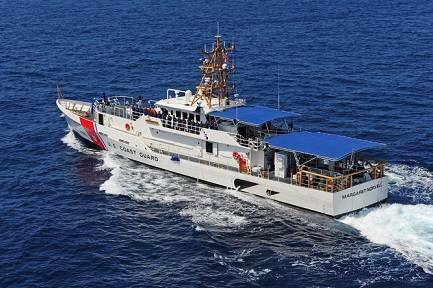 The cutter is the first in its class to be named after a Coast Guard heroine. Norvell, a member of the U.S. Lighthouse Service, first served at the Head of Passes Light as an assistant keeper from 1891 to 1896. She was credited for numerous rescues during her time as keeper, maintaining a vigilant watch at the entrance of the Mississippi River. In just one of many rescues, Norvell saved a survivor of a downed airplane in 1926. When she received word a naval airplane had gone down in Lake Pontchartrain, she jumped into her boat and rowed to the survivor of the crash. After battling a squall for two hours on the lake, she rescued the survivor and brought him safely back to shore. Norvell’s resilience was most evident during a storm in 1903. The powerful storm destroyed every building in the small community but one – her lighthouse. Norvell provided shelter and cared for the more than 200 people who had been left homeless. “Before this cutter I had no clue who Margaret Norvell was or what she did for the service. But now that I have learned not only the stories of the lives she saved as a lighthouse keeper but also how she supported her family, it motivates me to be a better person for mine,” said Petty Officer 1st Class Eduardo Quinones, a machinery technician aboard cutter Margaret Norvell. Her bravery as she pulled in shipwrecked sailors did not go unnoticed and she was soon appointed keeper of both Port Pontchartrain Light and West End Light. In the end, Norvell stood the watch for 41 years with the U.S. Lighthouse Service. Being a lighthouse keeper was one of the first non-clerical U.S. government jobs open to women. While many may not know the story of Norvell, or other lighthouse keepers like her, the crew of cutter Margaret Norvell hopes to embody her trailblazing spirit. “Being a plank owner is a great honor. It’s honoring my country, my home state, the family of a hero and my family. It allows me to be a part of Coast Guard history. Being a part of the commissioning crew and getting to meet the Norvell family has been a unique experience I won’t soon forget,” said crewmember Petty Officer 1st Class John Thompson. Norvell’s heritage as a humanitarian and lifesaver will live on in every crewmember serving aboard her namesake. At 154-feet long, an impressive array of capabilities and the newest shipboard technologies, there is no doubt they will live up to Margaret “Madge” Norvell’s legacy.